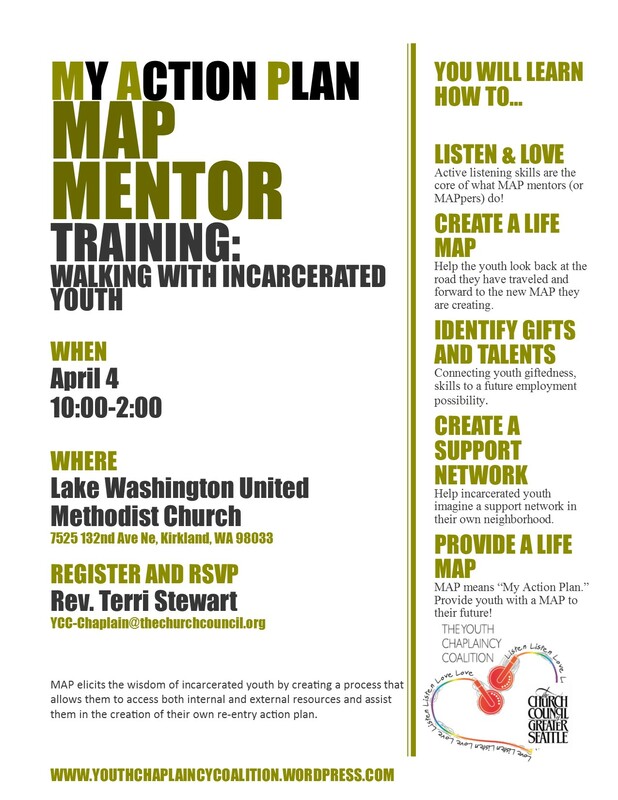 MAP is intended to be a service in addition to the chaplaincy, mentorship, counseling and probationary resources currently available to the youth housed in the King County Youth Detention Center and potentially Echo Glen Children’s Center. MAP was developed as a re-entry planning program which emphasizes autonomy, empowerment, goal setting, and safety planning through a consistent one-on-one mentorship relationship. Mentors will meet at least five times over a period of one month or longer to identify and discuss obstacles and solutions to re-entry. This may include discussions about emotions, patterns of behaviors, life goals, and applicable community resources. Mappers are eligible incarcerated youth who may benefit from additional mentoring while incarcerated. Currently there are limited resources available that connect incarcerated youth with community resources on the “outs”. MAP was created to provide consistent mentoring while youth are incarcerated in order to ease the re-entry process by helping to identify progressive changes and possible community resources. MAP Mentors will work with incarcerated Mappers to develop a MAP, or “Action Plan,” that can be used as an additional resource and form of support after release. The plan will address specific needs unique to each youth and will be compiled and presented to the youth during the final meeting. This binder will include resources, action-steps, and summaries of what was discussed throughout mentorship. A “MAP” may also provide a forum through which youth can express and act upon their own wants and personal goals as they relate to community needs and productive roles in society. Delivered at Liberation UCC in Seattle on 4/18/2014-Good Friday. What if every time we left a vulnerable, grieving member of our family behind, we turned to another beloved and said, “Please, receive my family as your family.” But we are not taught to do this! Our culture has us holding our chin up! Standing on our own two feet! You should learn to be self-reliant! Recently, as in Tuesday, I heard similar words come from a youth’s mouth. He is 15, from a marginalized area in Seattle, and struggling in detention. He and I were talking about what his next steps were and what his dreams of life were. He described a future where he could have a house that his family lived in—his mother and brothers and where he could have a game room and a workout room. Maybe, it would be a game room – slash – workout room—that was negotiable. Taking that as his vision for his life, we talked about accomplishments that would enable him to achieve his vision of a cared for, stable, ordinary family and house. He expressed the thought that he should get a job now while his rent was free so he could save all his money and buy a house when he was 18. He could do it! All by himself! All he needed was a job at the Boys and Girls Club that pays $600 per month and he’s good. He can do it if he tries. It is all in his hands. Never mind that he has a criminal record. Never mind that he can’t do math or science and probably will not be able to graduate high school. Never mind that he has nobody in his community to help him—I asked. None of that matters. He has bought the cultural ideal of independence and self-reliance. The question is, what comes next? What will happen when this youth cannot get a bank loan, a full time job, or a GED? He will blame himself, not the systems that have failed him. And in blaming himself, he will be filled with shame and sadness. In these words of Christ, we could hear not a nice moment of care-taking between beloved disciple and mother, but a command of how we should care for one another, especially those who are vulnerable. These words of Christ call out to us to receive our vulnerable youth, those affected by incarceration, gangs, and substance abuse. What difference would it make to a vulnerable youth to have some behold them! See them! Love them! Receive them! Interestingly, another possibility examining the word for “receive” in Greek elaben is the word “catch.” Doesn’t that really bring a different feeling to this? We are not only being called to receive the vulnerable among us, but to catch them. Provide a safety net that will enable them to grow into all that they were created to be. What if we said, What if we said, “People, behold your children—and you—behold your people.” What a difference it would make. Being empathetic, not sympathetic. Truly try to understand how the other person might be feeling without being judgmental. Your youth doesn’t want pity, but does want to feel like you understand, even if you can’t specifically relate the situation to your own life. Paraphrases: Restatements of the speaker’s feeling or meaning in your own words. Paraphrases help against miscommunication and can clarify feelings. Feeling reflections: Statements that focus on the emotions or feelings you observe in the speaker. This validates emotions. Clarifications: Questions or comments to elicit more information from the speaker and to double-check your and the speaker’s understanding of the problem. Neutral statements: Brief verbal responses that show the speaker that you are following the conversation. Summaries: Organizing statements that capture the speaker’s emotions and concerns concisely. A summary helps integrate the information you’ve heard, leads to new directions in conversation, and helps wrap up a listening session. Look the person in the eye. Good eye contact shows that you are paying attention and take the conversation seriously. Watching the speaker also lets you read thje speaker’s body language, which may say a lot about how she feels. Use natural posture. Be relaxed. Slouching, resting your head on your hands or crossing your arms on your chest can signal boredom, fatigue, or restlessness. Sit in a helping position. If you sit across from a person with a table in between, you may put yourself in an “oppositional” stance. Sit at an angle and lean slightly towards (but don’t crowd out!) your youth. The Youth Opportunities Act (HB 1651) is sitting in the House Rules Committee. We are hoping it will move to the House Floor today, and be ready for a vote in the next few days. It is very important that we get as many representatives to vote for it as possible. Overwhelming support shows that it is a priority that the Senate must take seriously. Bills that do not get voted out of the House by Tuesday are dead. So, please take a moment today to contact Representatives and urge a yes vote when HB 1651 reaches the floor. House Republicans are especially critical for this vote, so we would suggest you focus your efforts on them if your time is limited. PLEASE NOTE: We have attached a letter from the a national conservative policy organization, Right on Crime, which explains why the YOA is good fiscal and public safety policy. Please feel free to quote from it or use it however you feel useful. The list of House members are here: https://dlr.leg.wa.gov/MemberEmail/Default.aspx?Chamber=H. You can send them emails directly from this page.